Etusivu / In English / How to use assignments? How to use assignments and group assignments -functions. In 2015 we developed much anticipated feature to return assignments so that the whole group (seminar, demo, excercise group etc.) can see the returned assignment in addition to the teacher. Read more: Plagiarism detection in the University of Jyväskylä. NB! Plagiarism detection is also used in Moodle. The plagiarism detection system used at the University of Jyväskylä is Turnitin. 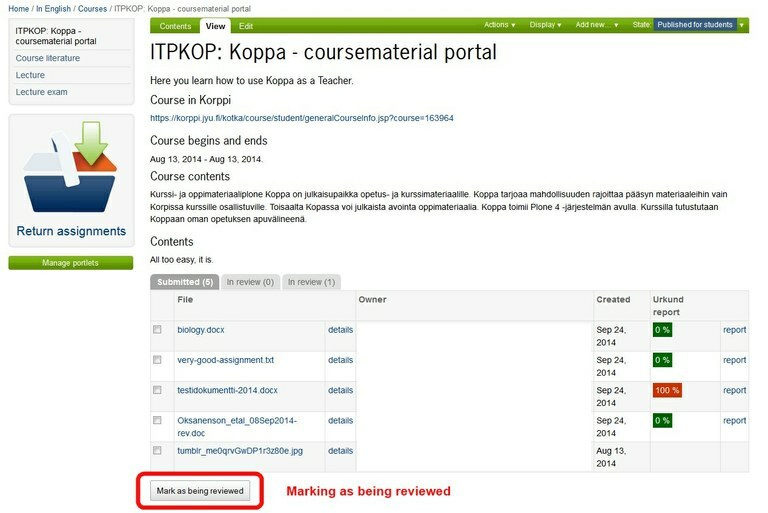 When a student submits an assignment to Koppa s/he accepts the use of plagiarism detection. After the assignment has been submitted to Koppa it's also submitted to Turnitin. Teacher will receive a plagiarism detection report regarding the submitted assignment from Turnitin within few minutes. Teacher can then view the report using ordinary web browser without signing in separately. Student accepts the plagiarism detection contract when s/he submits an assignment. The plagiarism detection report is visible only to the teacher and student himself. Teacher can view submitted assignments in the course folder in a list format. Teacher sees the state of the plagiarism detection and a link to a more precise report. Plagiarism detection report can be observed in Turnitin without separately logging in to it. 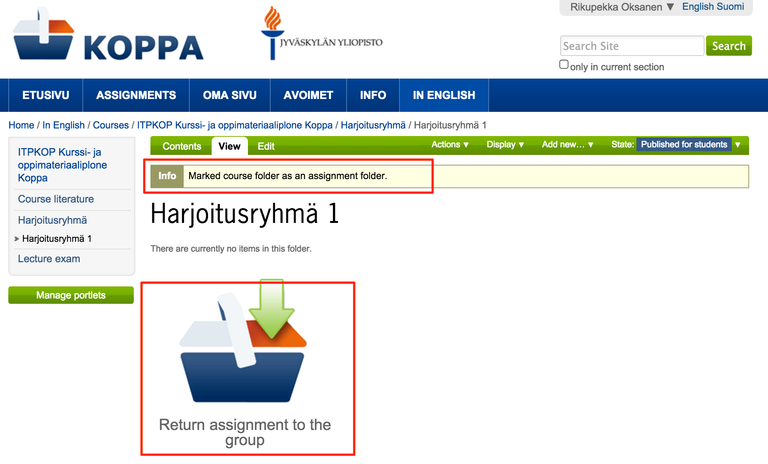 Upload function allows the user to upload several files to Koppa at once. This function can be found from folders, from View tab and under Actions. 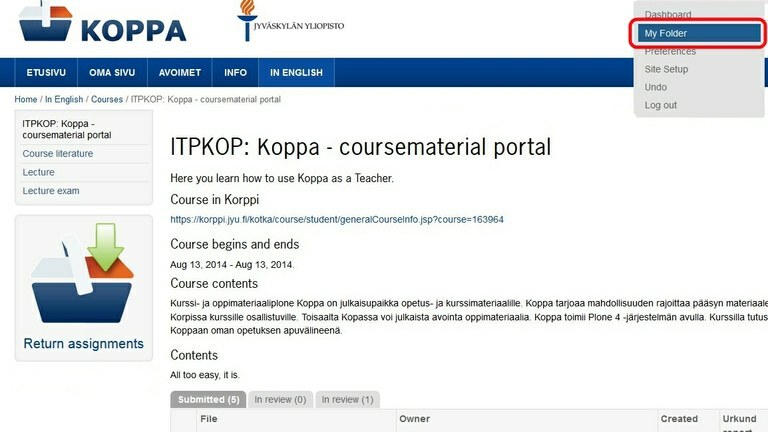 Koppa has the ability to get course information automatically from Korppi. Edit submitted assignments before the teacher has taken it for reviewing. Upload several files to Korppi at once. 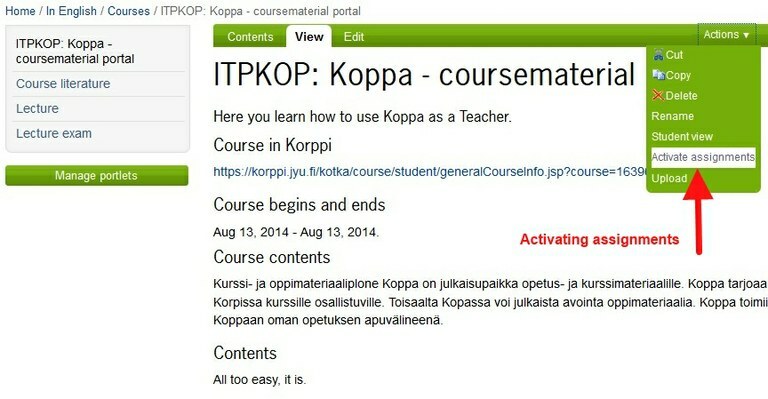 In future Korppi will be able to update additional information and for example the beginning and ending dates of a course. If you have problems with updated Koppa, don't hesitate to contact plone-support@jyu.fi!